We know that what puts so many people off natural shampoos is the lack of froth-factor. In reality, less foam doesn’t necessarily mean less cleansing power – but we’re so conditioned to the feeling of foaming over a lifetime that it can be a turn-off to many. We’ve done that – and we’re just loving the results. 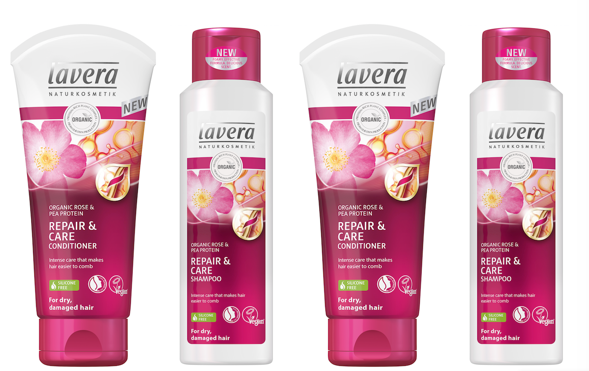 Well, we’ve tried one so far – but we’re confident enough to recommend the six-shampoo/three conditioner range on the strength of the stellar performance of the Repair & Care Shampoo and Conditioner, which is ideal for summer-ravaged hair (like ours) right now. It’s enriched with organic rose and pea protein – and the former, certainly, makes hair smell just lovely. The duo leaves hair super-silky, super-shiny – and that promised froth means we know it’s getting hair optimally clean, too. • Colour & Shine Shampoo is packed with natural avocado oils, cranberry and other antioxidants, together with vitamin C to promote healthy hair growth). This has a ‘matching’ Colour & Shine Conditioner, to go with the shampoo. • Volume & Strength Shampoo is the one when you need extra oomph (but don’t want to weigh hair down), featuring organic orange and green tea, which is an effective free radical scavenger. • Gloss & Bounce Shampoo promises to restore shine to dull, lacklustre hair through organic mallow and a pearl extract. (Though frankly, the Repair & Care shampoo did that job perfectly, for us.) This is also a duo, with a Colour & Shine Conditioner, too. • Freshness & Balance Shampoo is the choice for greasy hair and scalps, designed for daily cleansing without drying hair out, and with a great zingy smell (from organic lemon balm and mint). But all 100% worth a try, at these affordable prices.